Still buying music on Apple Music or Amazon? Forget it. Why fork out your cash to buy MP3 songs for iPad if there are tons of ways to download free music to iPad? We picked out top 10 free music download sites, top 10 free music download app for iPad, and the best free music downloader for iPad Pro/Mini 4/3/Air 2 and older iPad with a brief break down of what it is, pros, cons. MacX Video Converter Pro is an amazing music downloader, enabling you to download MP3 songs MP4 HD 4K free music videos for iPad Mini 4/3/Pro/Air 2 etc. on Mac and Windows within merely seconds from YouTube, SounCloud, Dailymotion, Vevo, Vimeo, Metacafe, etc. How to download free music on iPad: copy and past song URL > select file size, resolution, output folder > click "Download Now" > sync to iPad. Pros: download MP3 songs for iPad, provide online listening, offer search bar, a wide range of songs with different file size and time duration. Cons: brim with confusing download buttons, ads and virus, high privacy and copyright risk. Pros: a wide collection of genres and songs from different time period, free download MP3 music for iPad, no register required, bring many songs from unknown artists and bands. Cons: limited hit singles, flashing ads, not easy to search songs, few a-list pop artist. Pros: boast over 473,000 tracks and 40,000 artists for MP3 songs download on iPad, a great site to dig out great new artists, songs are well-chunked, most download, most played, latest release, access to upload your music. Cons: users can not download all music for iPad for free, music delivery includes Bit Torrent. Pros: tons and tons of free Bollywood songs, totally free, nifty web design, many radio channel, users can install its app to free download Hindi songs on iPad. Cons: register required, only Bollywood songs available, have English songs but sung by Bollywood star. Pros: download any free music on iPad with no limits, artist list from A to Z, 1to 9, clean interface. Cons: users may download plugins unconsciously, not one-click download, too many unrelated results, strict user terms and conditions. Pros: different songs charts, boast both English and Hindi free music download to iPad, users can share favorite songs to Facebook, Twitter, social networking sites. Cons: ads and plugins, confusing download buttons, slow download speed, offer less free songs storage. Pros: individual free music downloads for iPad, embrace exclusive samplers and releases, easy to share your favorite songs with your friend. Cons: need to provide your email address and postal code in turn, pay what you want to download or tell 3 friends about an artist to download free music to iPad. Pros: one of the best MP3 free music downloads site for iPad in US, a wide range of genres and radio, users can rate songs, albums. Cons: users can not fast forward, record and rate the new tracks on like stations. Register required. Pros: millions of songs to free download to iPad, Xbox Music app is available now to download free music on iPad, music library is better than Spotify or Pandora, clean interface. Cons: only 30 days free trial, no different songs genres list, no lyrics. Pros: provides free music downloads for iPad in MP3, features songs in kinds of genre, rock, pop, country, metal, blues, dance, and more, users can also login in and upload songs, few ads and plugins. Cons: sometimes slow in responding, register required if users want to upload songs. The best free music download for iPad offers an easiest solution to download MP3 music to iPad from the free music download sites, convert to MP3 MP4 for iPad Pro/Air 2, iPhone XS/XR/X/8/7 etc. Pros: free streaming YouTube songs on iPad, 100 million songs for downloading, create songs playlists, users can control music through car, lockscreen, etc. Cons: disables SoundCloud now and user can't enjoy SoundCloud songs offline, pay for it to remove ads. Pros: offer free music downloads for Android, iPad with iOS 7 or later, control music through lock screen. Cons: only stream free legal songs to iPad, songs may disappear from playlist if the uploader delete them. Pros: stream music on iPad, play music in full screen mode, integrated music player, airplay support. Cons: the free music downloader app for iPad is supported by ads, songs may be deleted, crash sometimes. Pros: support multiple languages, create as many playlist as you like, sync songs for off-line listening. Cons: ads, only available in US, free music downloads on iPad may be gone. Pros: 7 million songs from local library, get free music downloads for iPad from 3 to 5, compatible with iOS 8. Cons: users can't control music via home screen, limited artists and genres, the best music downloader free app for iPad has download limits, interface is not intuitive. 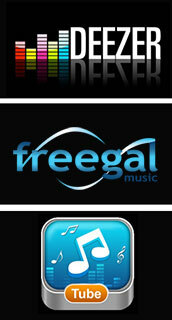 Pros: free iPad music downloader and player, watch HD music video on iPad, top 100 list. Cons: too many ads, always ask you to rate the app, playlist only contains a certain number of songs. Pros: This free music download app is capable of downloading free music on iPad from DropBox, Google Drive, Box, etc. 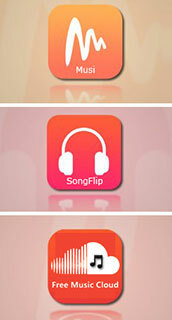 play MP3, AAC, M4A, AIFF songs. Cons: users can't download or play DRM protected songs bought from iTunes store. Pros: free streaming music to iPad, easy to use, PassLock feature, search songs from all countries. Cons: limit section and free hit songs downloads for iPad, no user guide, like how to download free music on iPad. Pros: offline mode offers access to download free music on iPad for offline playback. Cons: crash a lot, can not be used in airplane mode, still play when phone rings. Pros: light size, support iOS 8, a wide of genres for free music downloads for iPhone iPad, feature-rich media player. Cons: slow to load sometimes, have poping ups and ads, may crash when users play songs.